To add users to the group, you can use UI tools such as Active Directory Administrative Center (ADAC) or Active Directory Users and Computers, or a command-line tool such as Dsmod group, or the Windows PowerShellAdd-ADGroupMember cmdlet. Accounts for services and computers should not be members of the Protected Users group. Membership for those accounts provides no local protections because the password or certificate is always available on the host. To provide client-side restrictions for Protected Users, hosts must run Windows 8.1 or Windows Server 2012 R2 . A user only has to sign-on with an account that is a member of a Protected Users group. In this case, the Protected Users group can be created by transferring the primary domain controller (PDC) emulator role to a domain controller that runs Windows Server 2012 R2 . After that group object is replicated to other domain controllers, the PDC emulator role can be hosted on a domain controller that runs an earlier version of Windows Server. To provide domain controller-side restrictions for Protected Users, that is to restrict usage of NTLM authentication, and other restrictions, the domain functional level must be Windows Server 2012 R2 . For more information about functional levels, see Understanding Active Directory Domain Services (AD DS) Functional Levels. Two new operational administrative logs are available to help troubleshoot events that are related to Protected Users: Protected User - Client Log and Protected User Failures - Domain Controller Log. These new logs are located in Event Viewer and are disabled by default. To enable a log, click Applications and Services Logs, click Microsoft, click Windows, click Authentication, and then click the name of the log and click Action (or right-click the log) and click Enable Log. The AS exchange is where the client uses the account's password or private key to create a pre-authenticator to request a ticket-granting ticket (TGT). This happens at user sign-on or the first time a service ticket is needed. The TGS exchange is where the account's TGT is used to create an authenticator to request a service ticket. This happens when an authenticated connection is needed. The user's account domain must be at Windows Server 2012 R2 domain functional level (DFL). Ensure all the domain controllers are Windows Server 2012 R2 , and then use Active Directory Domains and Trusts to raise the DFL to Windows Server 2012 R2 . Let's say you wanted to restrict authentication based on the organizational unit (OU) of the computer, which was already configured, but only for Computer classes. 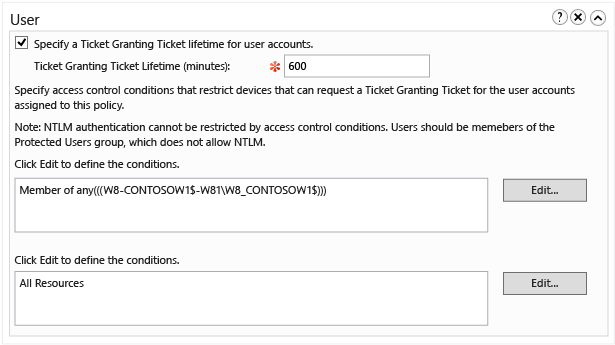 A new Authentication Policy Failures - Domain Controller administrative log under Applications and Services Logs > Microsoft > Windows > Authentication has been created to make it easier to discover failures due to Authentication Policies. The log is disabled by default. To enable it, right-click the log name and click Enable Log. 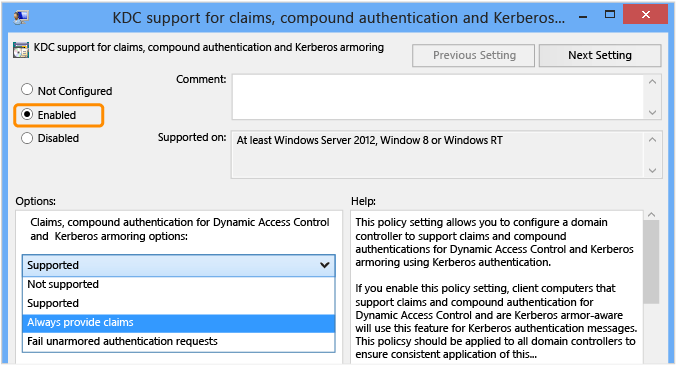 The new events are very similar in content to the existing Kerberos TGT and service ticket auditing events. For more information about these events, see Authentication Policies and Authentication Policy Silos.